by Hadeer Abbas, Reuters – Sunday April 24, 2011 at 9:52 AM ET. BAGHDAD (Reuters) — A roadside bomb exploded near the rear entrance of a Catholic church in Baghdad after Easter services on Sunday, wounding at least two police officers and two civilians. The bomb blew up outside Sacred Heart church in Baghdad's central Karrada district, shattering windows in nearby buildings and severely damaging a police pick-up truck at the church gate. The explosion occurred after the church had been cleared of parishioners following services on Easter Sunday, which marks the resurrection of Christ after his crucifixion. 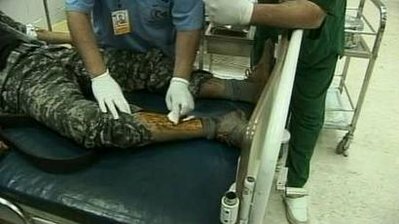 Two security sources said two policemen and two civilians were hurt in the bombing but a Reuters TV cameraman saw three wounded police and four injured civilians at a local hospital. "We had just reached the scene to distribute food to the policemen there and when we arrived the bomb blew up," police officer Hassan Dalli said at the hospital where he was taken for treatment. A colleague was stretched out on a gurney nearby. Iraqi police and soldiers were out in force on the streets on Sunday, in part because of a recent spate of assassinations of government and security officials. The country's Christian community has been on high alert since a militant assault on a Syrian Catholic cathedral in central Baghdad last October in which 52 people died. Iraqi forces have provided extra security to Christian churches since the assault on Our Lady of Salvation cathedral, the bloodiest against Iraq's Christian minority since the 2003 U.S.-led invasion that toppled Saddam Hussein. Iraq's Christians once numbered about 1.5 million but are now believed to have fallen to less than 850,000 out of a population of 30 million. 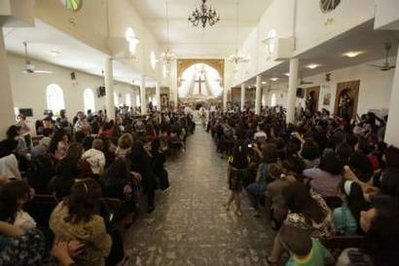 Hundreds of Christian families have fled to Iraq's northern Kurdish region or to nearby countries since the October cathedral attack, the United Nations has reported. Violence has fallen sharply in recent years but Iraq is still plagued by insurgents who carry out hundreds of bombings and other attacks each month. An Interior Ministry source said six officers from the Interior and Defense ministries, and nine civilian government officials, have been killed in the last week by gunmen using silenced weapons. 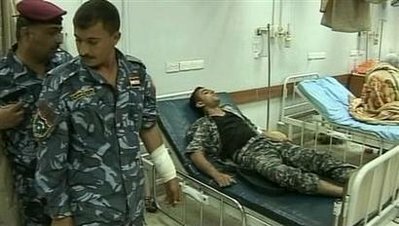 Seven security and 12 civilian officials were wounded in the attacks.